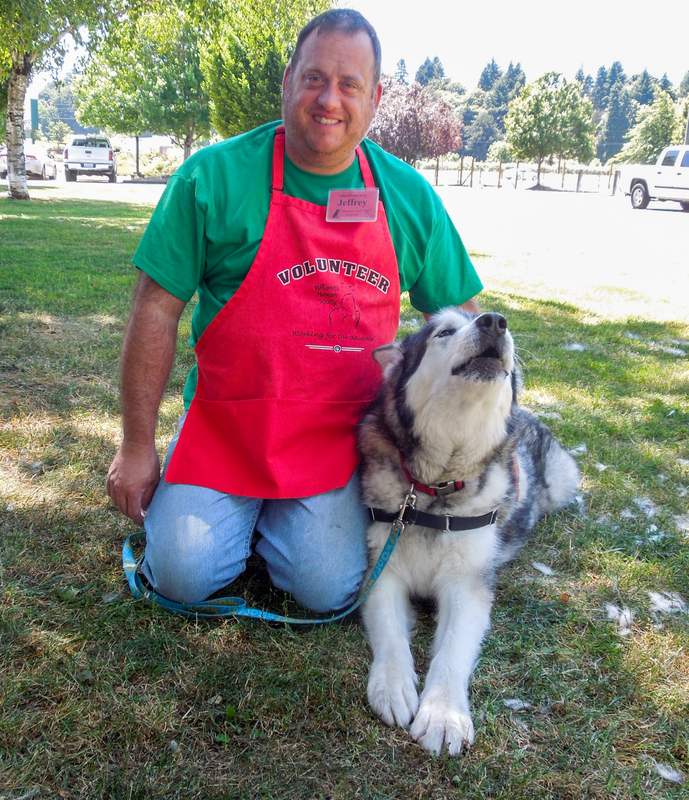 Sunday was a very big day for Willamette Humane Society. It was the annual WillaMutt Strut at Riverfront Park. It was an exciting, fun-filled morning with over 400 participants, breaking last year’s record! I was there taking pictures and video. I think my favorite shot of all was this one of Vinny in his Kissing Booth. 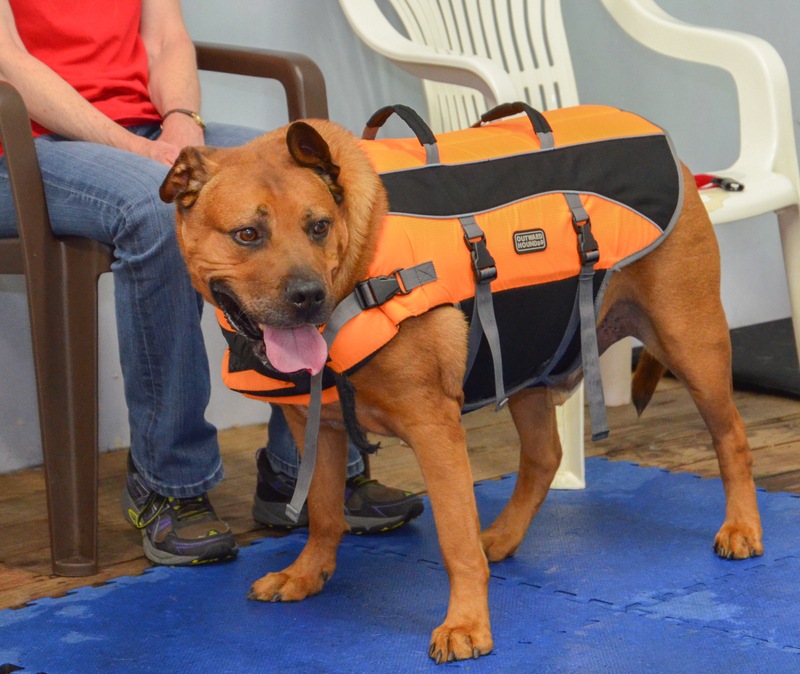 He belongs to our Volunteer Manager Kimmi and is a total ham. 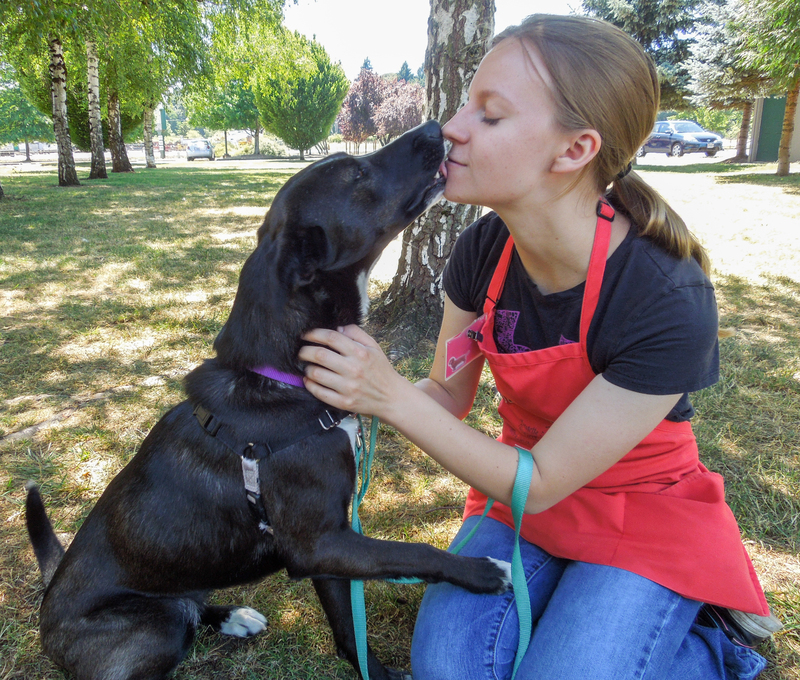 He earned $75 for the shelter by giving sloppy kisses, something he loves to do! The picture says it all. And here is the movie! 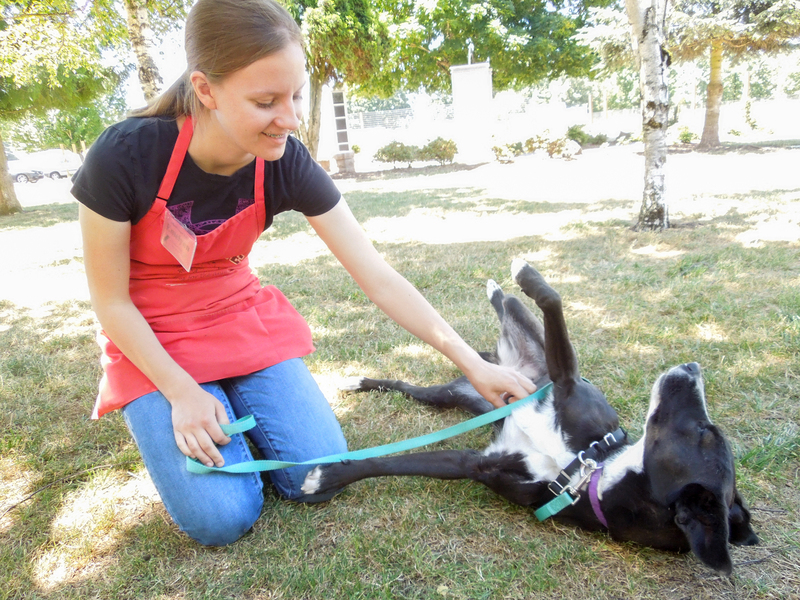 There were 13 dog adoptions last week, five of them were Blog Dogs. 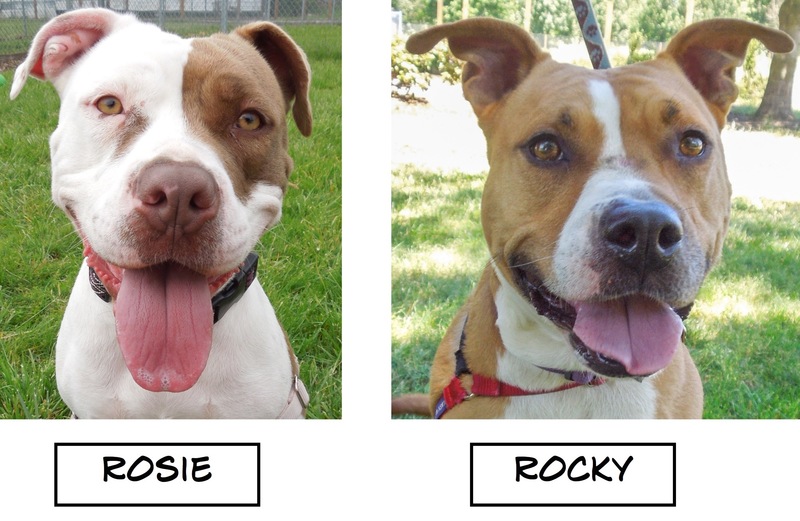 We felt so good about long-termers Rosie and Rocky finally getting adopted! 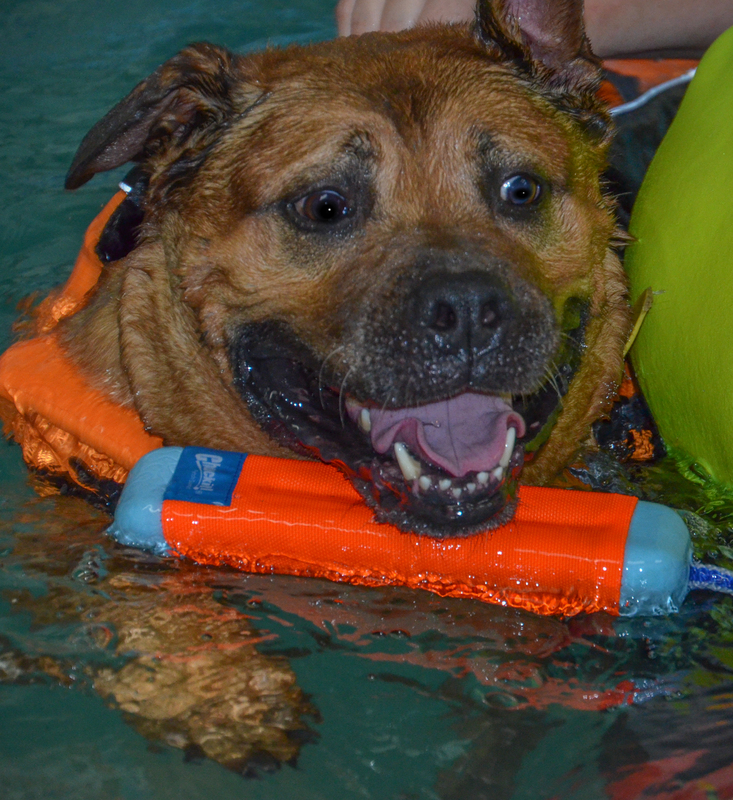 Last week volunteer Jolene and I took extremely overweight Charlie Brown to a swimming class at Bailey’s Journey. Little did we know walking in that Charlie LOVES to swim. He had a terrific time and was such a delight to watch. So even though he got adopted, I wanted to show you a few shots from his most excellent class. 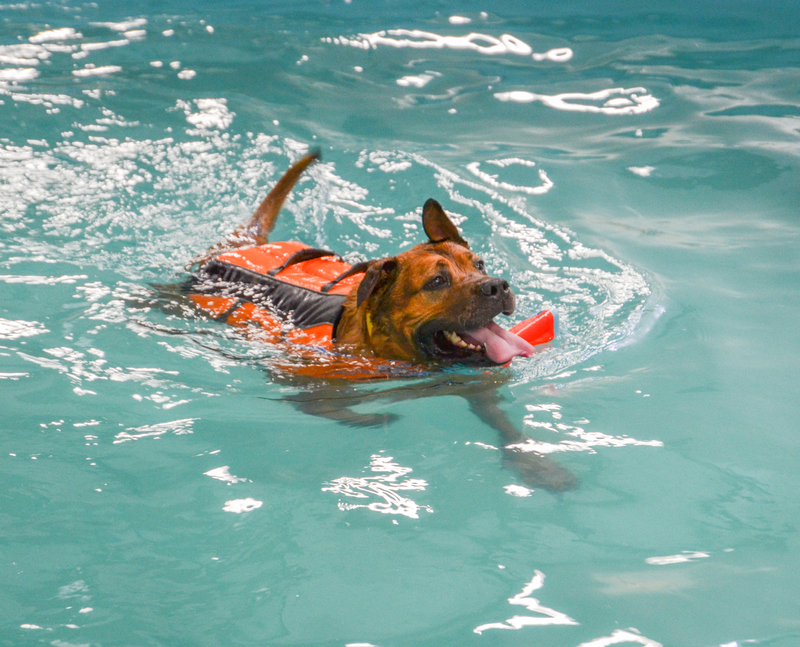 We are so lucky to have a dog swim facility in our community! Here’s the big boy getting ready to dive in. 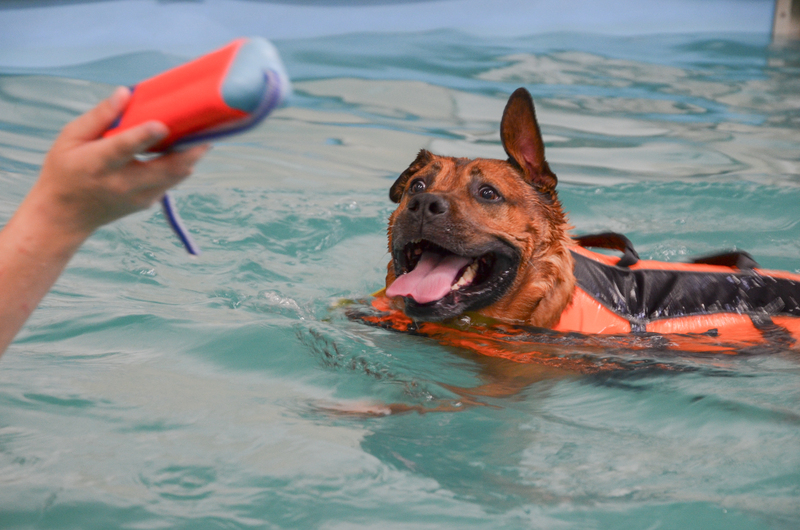 He was thrilled to be in the water and didn’t want to come out of the pool! I’m a newbie and I can’t wait to get adopted by you! 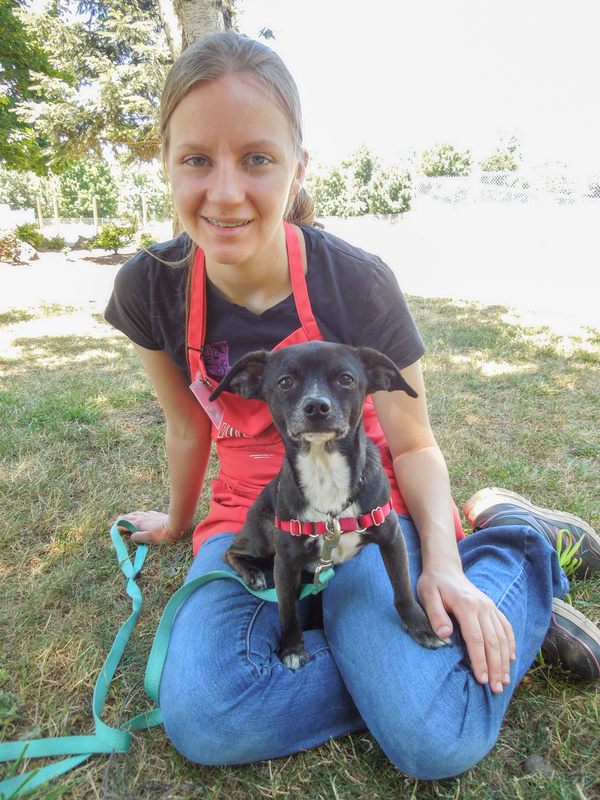 Chloe is a recent arrival through our S.T.A.R.T. partner in California. 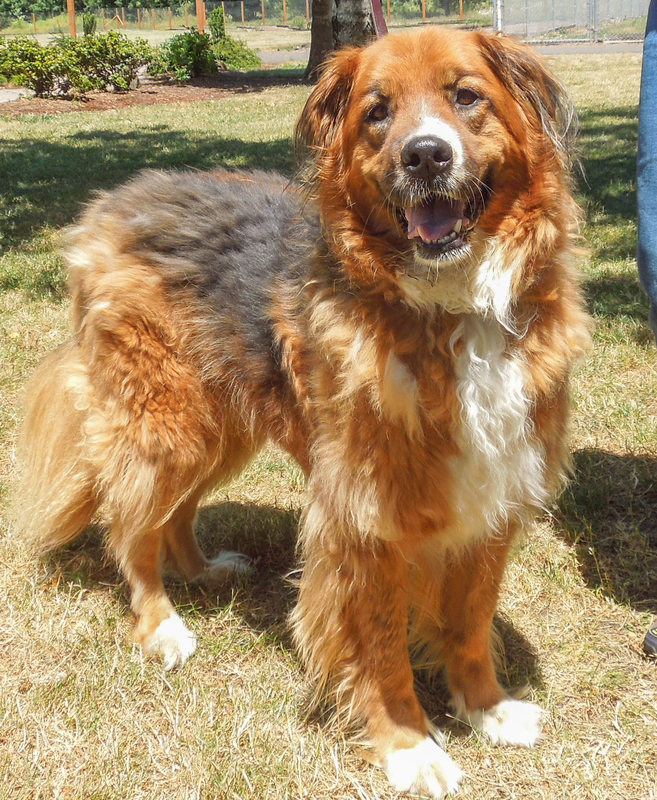 She is a five-year-old Saint Bernard/Golden Retriever mix (we think). If you faint at the sight of dog hair in the house, this girl is not for you! 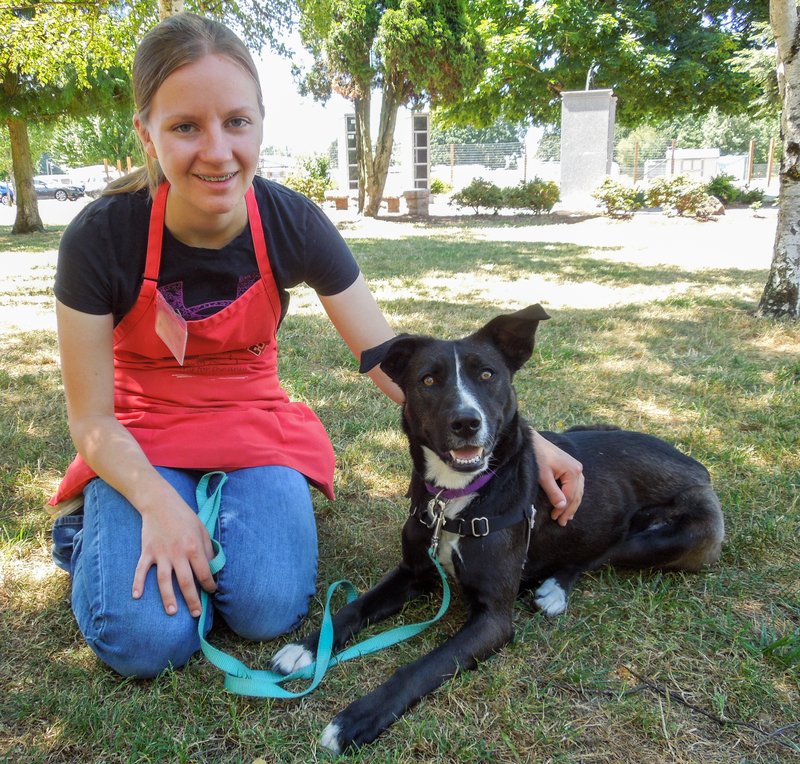 But if you are looking for an enthusiastic partner for jogging, hiking, trips to the coast, and active dog games, then Chloe might be your perfect fit. 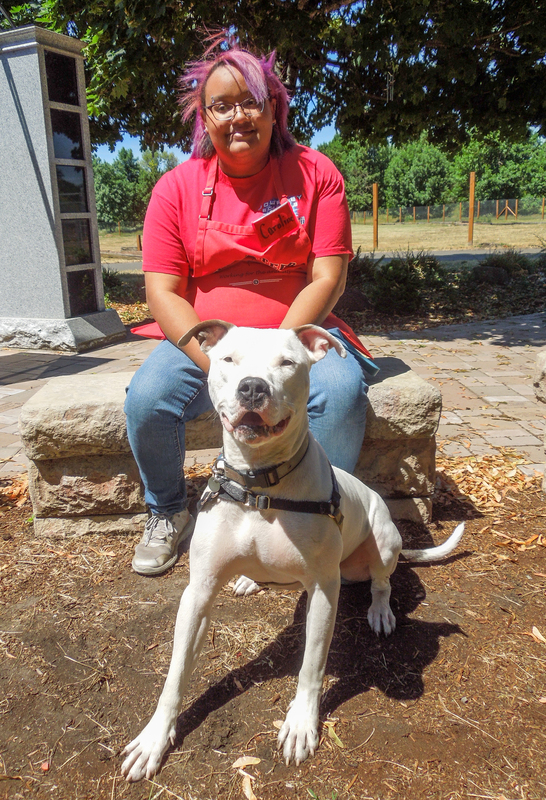 She’d love to attend a training class at the shelter, as she would like to learn the skills to make her a great family member. She will need people who will give her space when eating, as she can be possessive of food and treats. 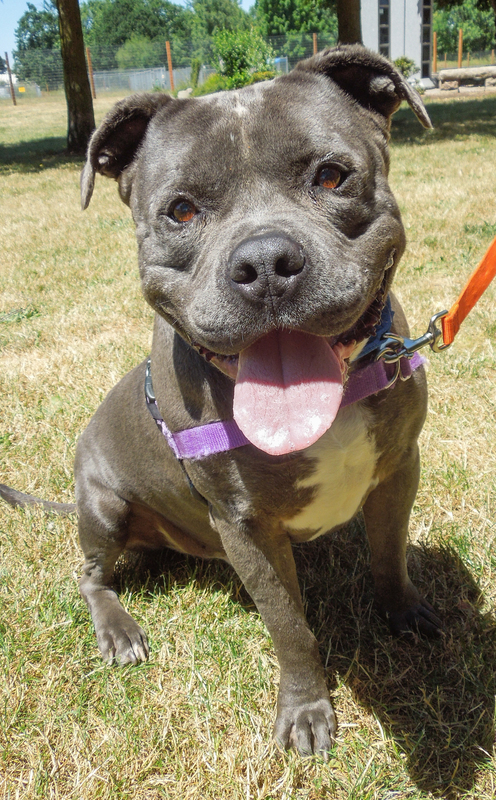 Chloe likes the company of other dogs, but would need to meet any future siblings. Here she is with Jolene last Sunday. Everyone here at WHS is amazed at how our personalities have blossomed! 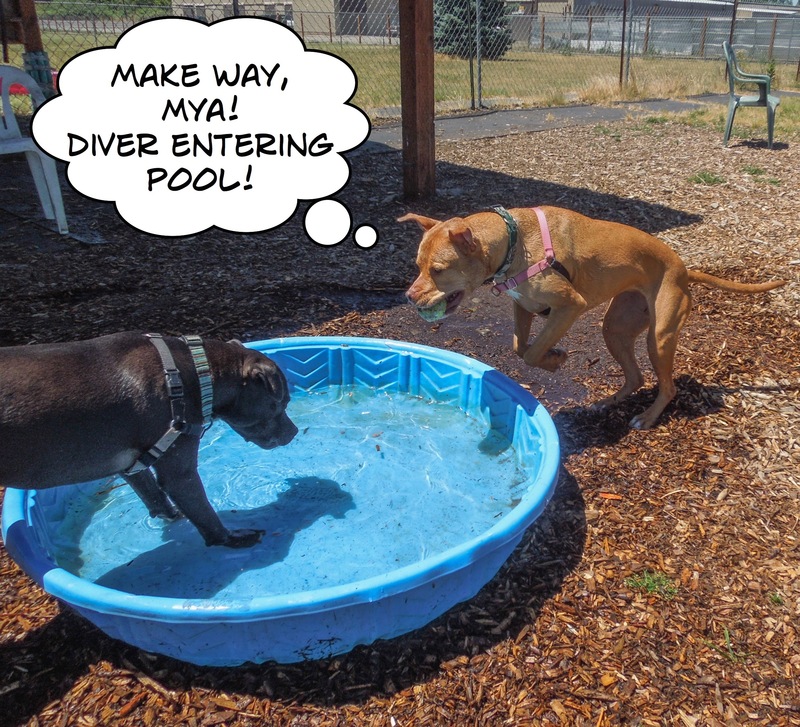 Last week I wrote about how Jade and Mya, bonded five-year-old Pit Bull Terrier sisters, had begun to show their true happy natures and had started to interact more with the staff and volunteers. Well, that was nothing compared to this week! The girls are delighting everyone with their goofy antics. 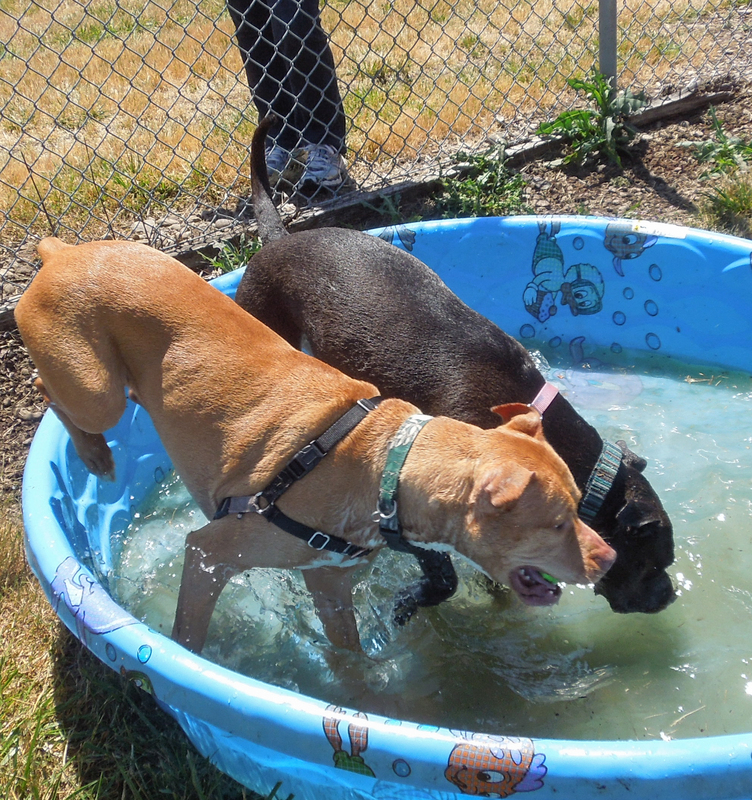 It turns out they both LOVE to play in the pools. 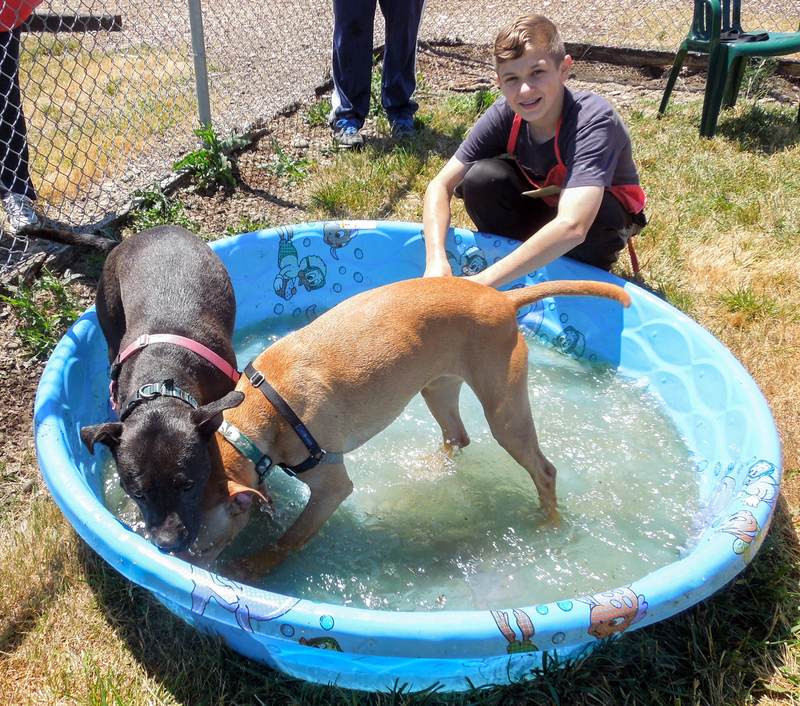 When I arrived at the shelter Sunday afternoon, volunteers Katie and her sons, Daniel and Laslo, had Jade and Mya out in a yard and couldn’t wait to have me see them play. Katie took some video to show the girls in action. 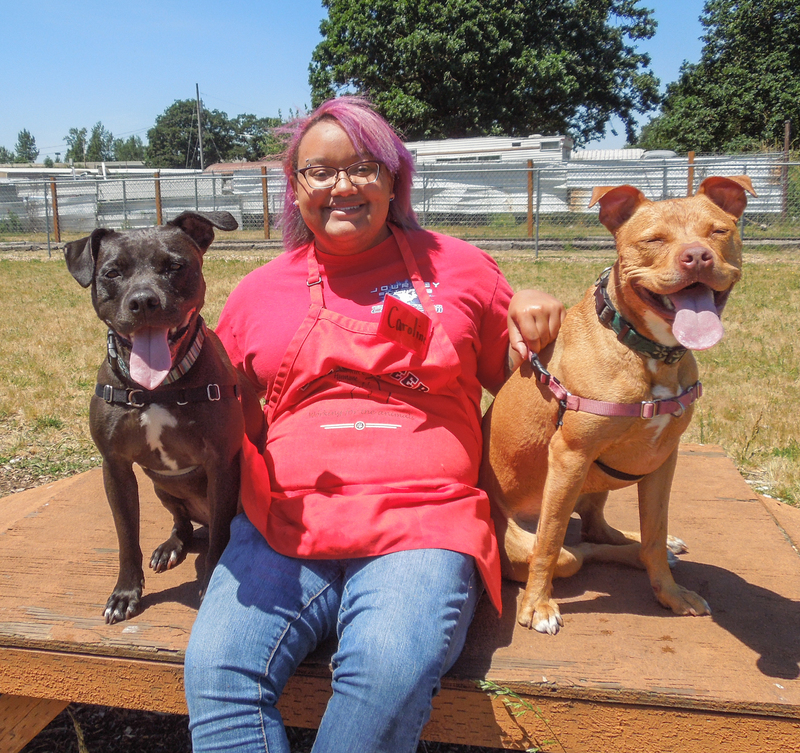 Jade and Mya need to go home together, and while adopting two dogs may seem daunting, they entertain each other so well, they will be a breeze to have around. And one thing is certain: they will keep their new family laughing! And today, Caroline and I took the girls out to the big yard. 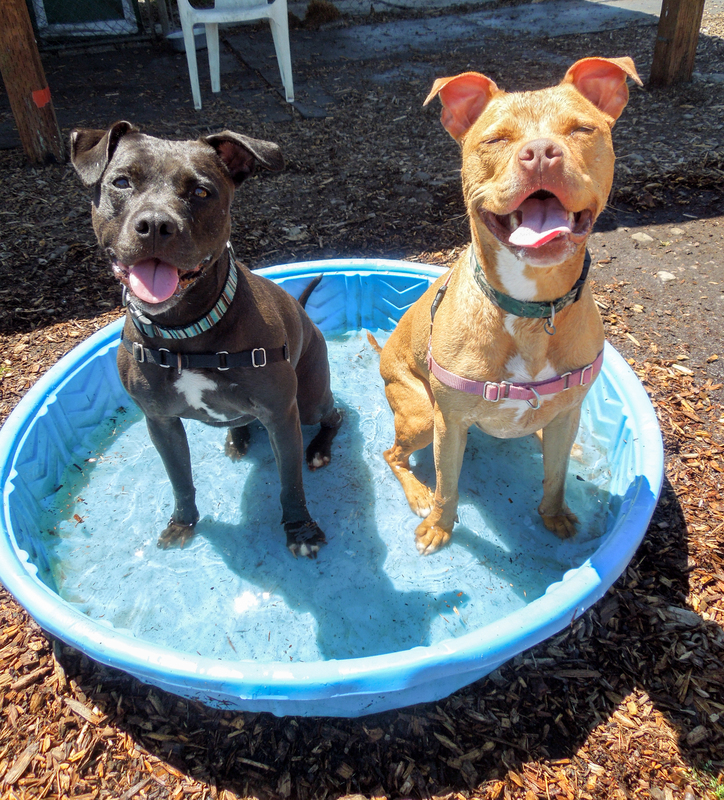 They loved playing in the pool and when I got the hose out, Jade was ecstatic and this was the result. 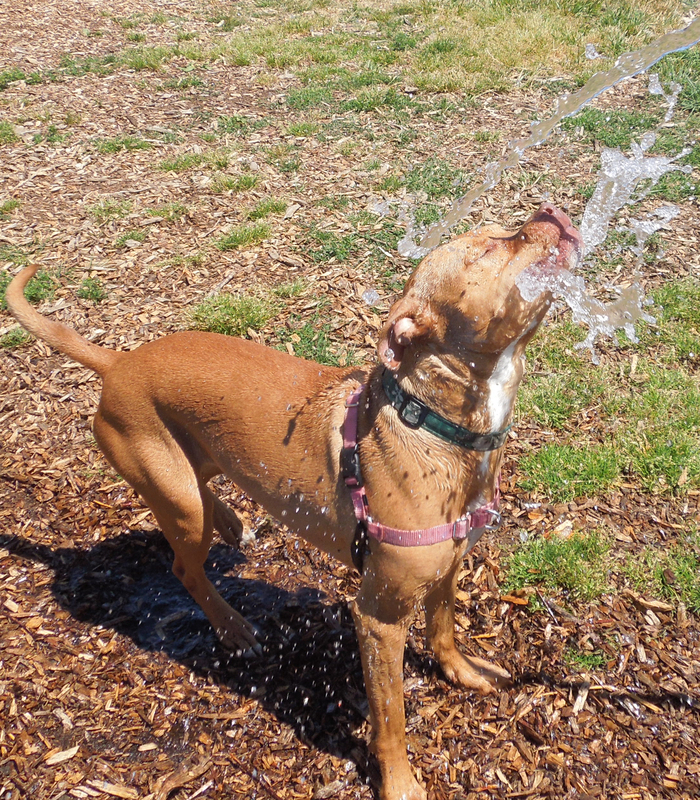 She absolutely loved gulping the water as it sprayed out of the hose. 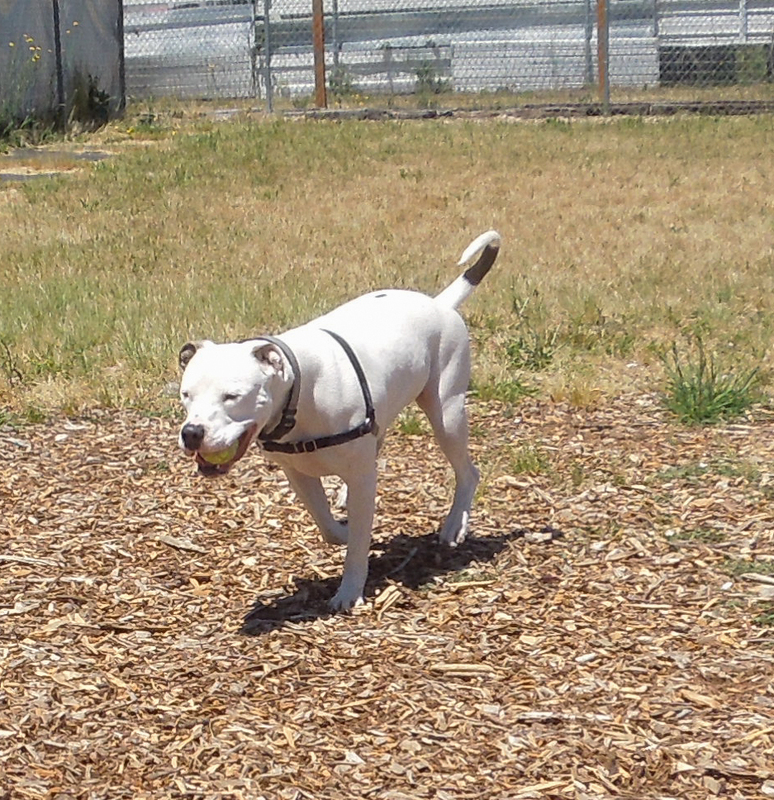 Then she raced around the yard, ball in mouth, before diving into the water. This is one of my favorite pictures of the girls! And after the pool antics, it was time to pose with Caroline. 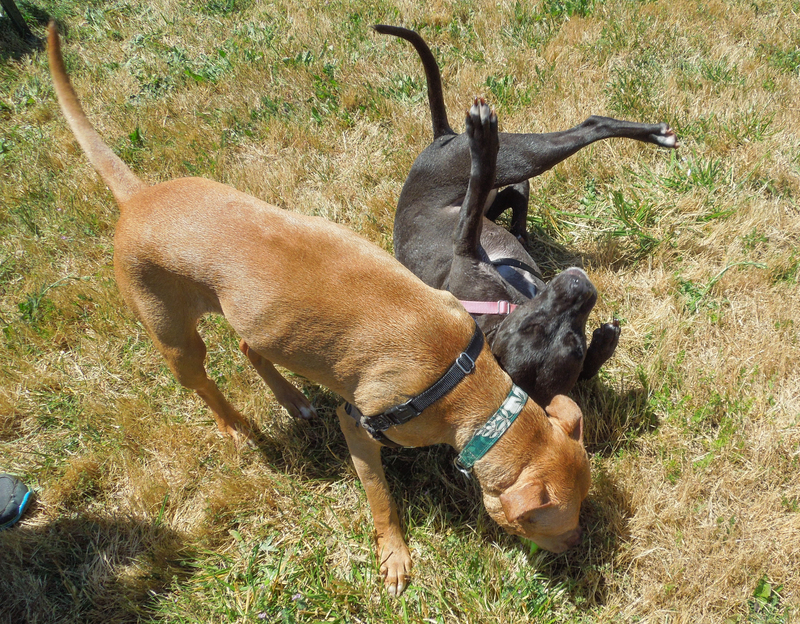 Mya and Jade are two of the happiest, most playful dogs I’ve ever known. 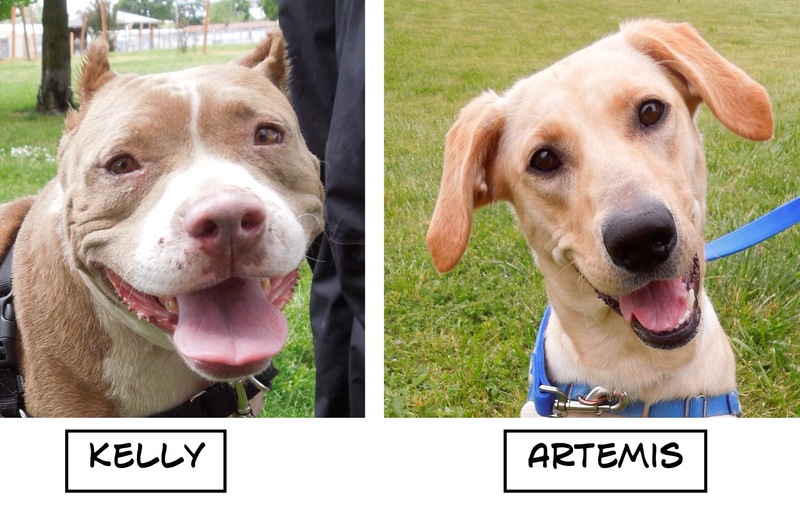 Some family is going to be so lucky to adopt these two girls! Trucker here, still waiting for my quiet last home. 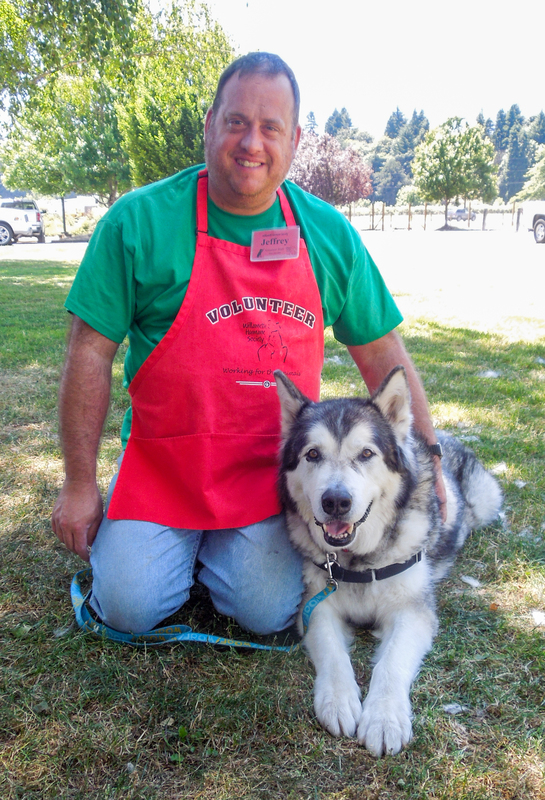 I first wrote about Trucker last week explaining that he is an eight-year-old senior Alaskan Malamute mix who is a gentle giant. He is looking for a quiet hospice home where he can hang out with his peeps. 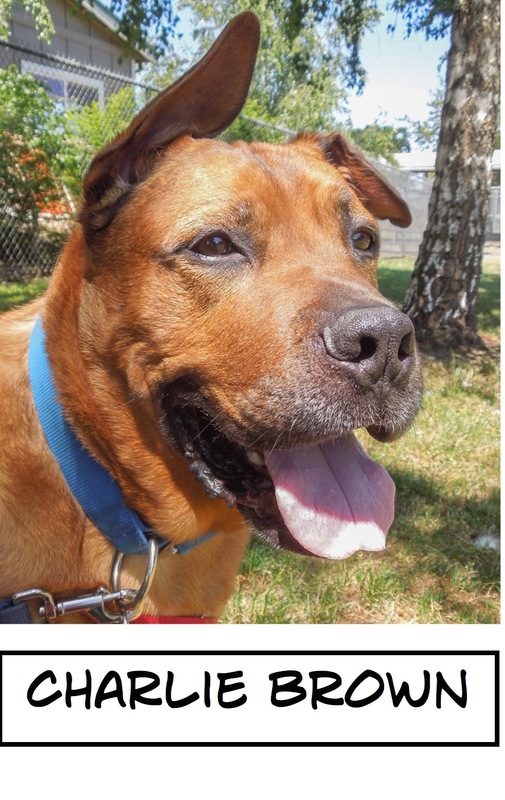 He can get around pretty well, short walks would be great for this old boy. He isn’t as stable as a younger dog, and does fall down sometimes. He has a great history with children, though they would need to be gentle with him, and is rated PG+5. He wouldn’t mind if other calm dogs came to visit sometimes, but would like to spend his remaining days as an only pet. 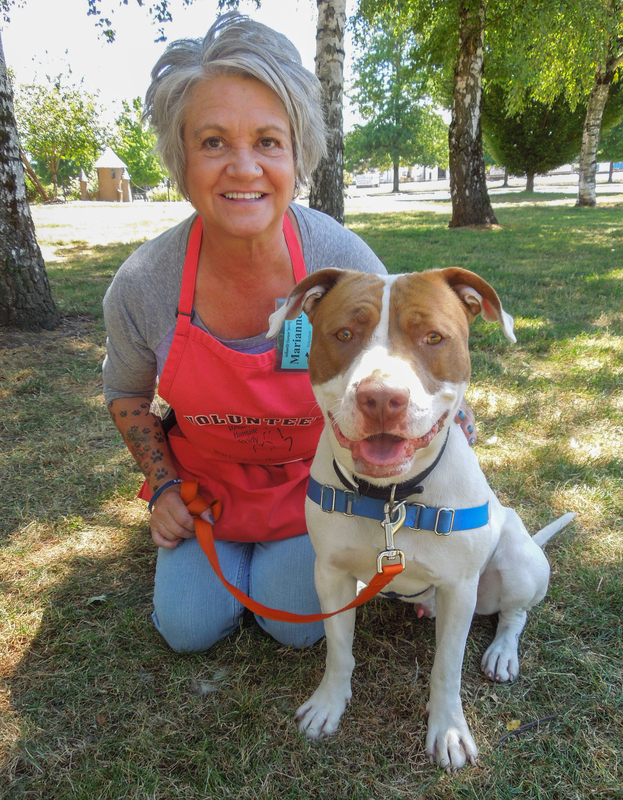 Trucker has won the hearts of everyone at the shelter, including volunteer Jeff. We’re hoping the perfect forever home will be found for this sweet boy. As you can see below, Trucker will happily sing along with you. My family moved and couldn’t take me with them, so I’m back to find new people to love. This time forever. 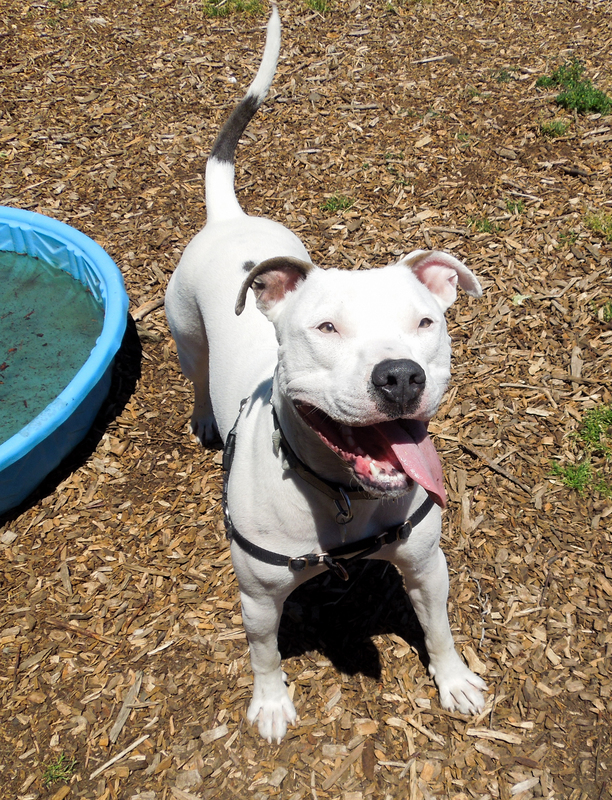 Sully, a two-year-old Pit Bull Terrier mix, is back at the shelter. I first wrote about him in my January 8th post. He was quite the loveable character then and he still is. I spent quite a bit of time with him today. He has grown up some, walks well on leash and is house-trained. He knows some commands, though he needs to work on taking treats more politely, which we practiced this afternoon. 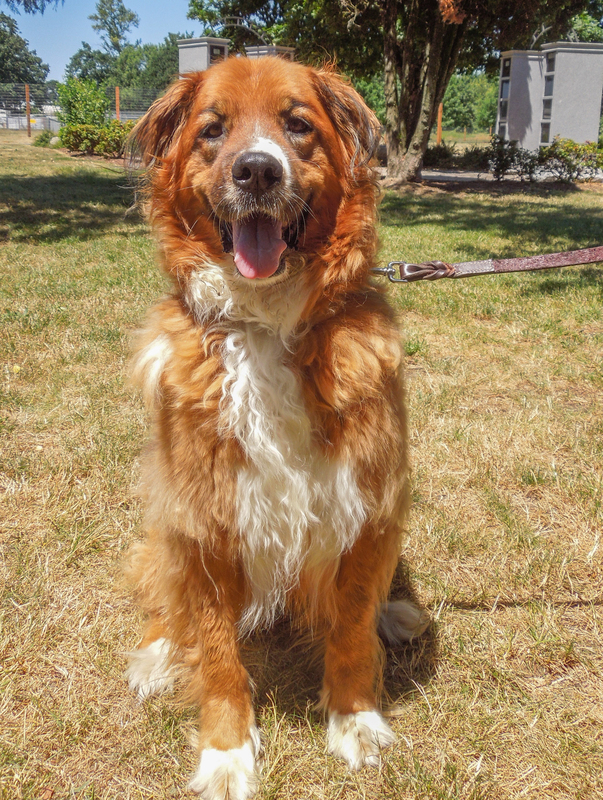 Sully is a very active boy and a physical player with other dogs (you can see his play style starting with the January 8th post). He also needs a home without cats. 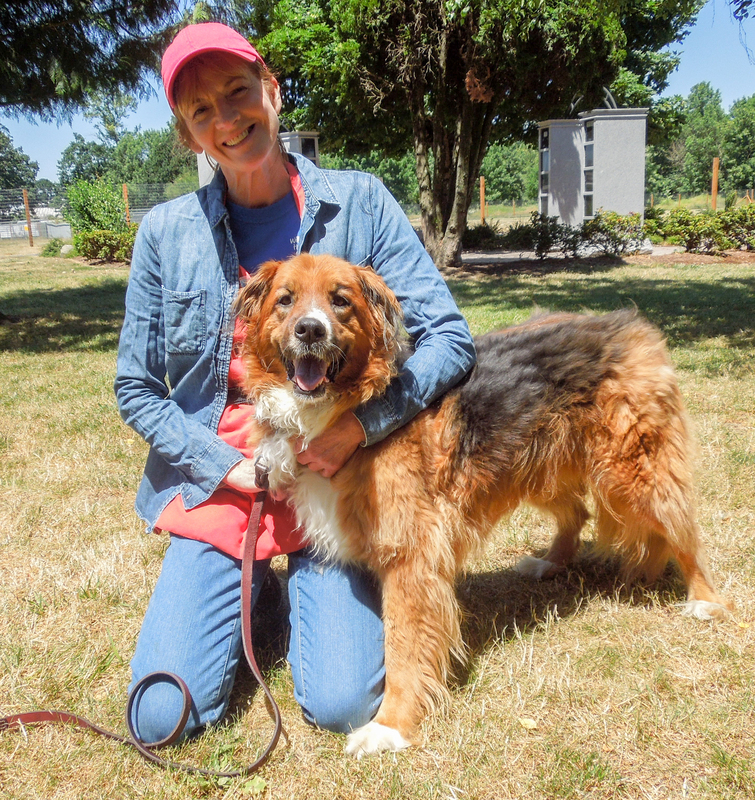 I hope Sully won’t have to wait long for a new family that will be his forever one. He’s such a good boy. We went into a yard to play fetch and I have to admit, just as in January, he needs more practice on actually returning the ball to you. Here he is as I am about to throw the ball. After our romp in the yard, we sat down with Caroline for a moment. I’m a working dog. Got a job for me? 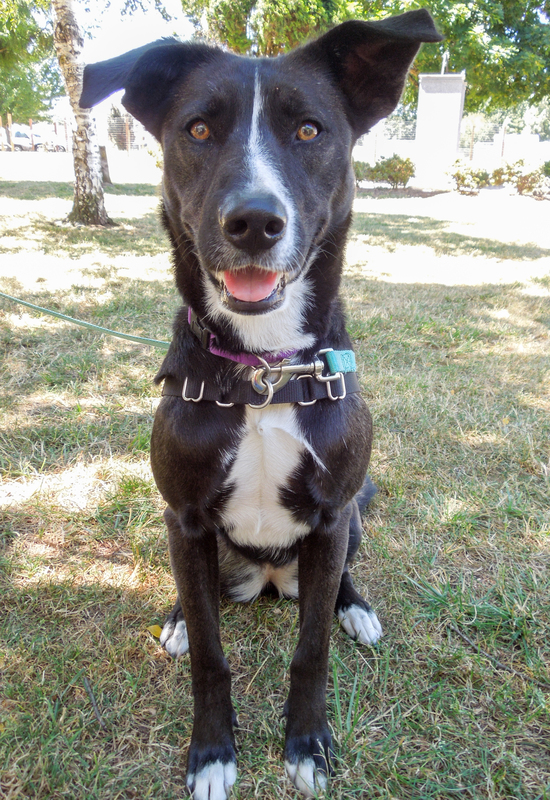 This beautiful dog is Elsa, a two-year-old Border Collie mix. She is smart, eager, and affectionate. She is, however, a dog in search of a job. That means that if you don’t keep her busy, she will have no choice but to dig out of your yard to find work. 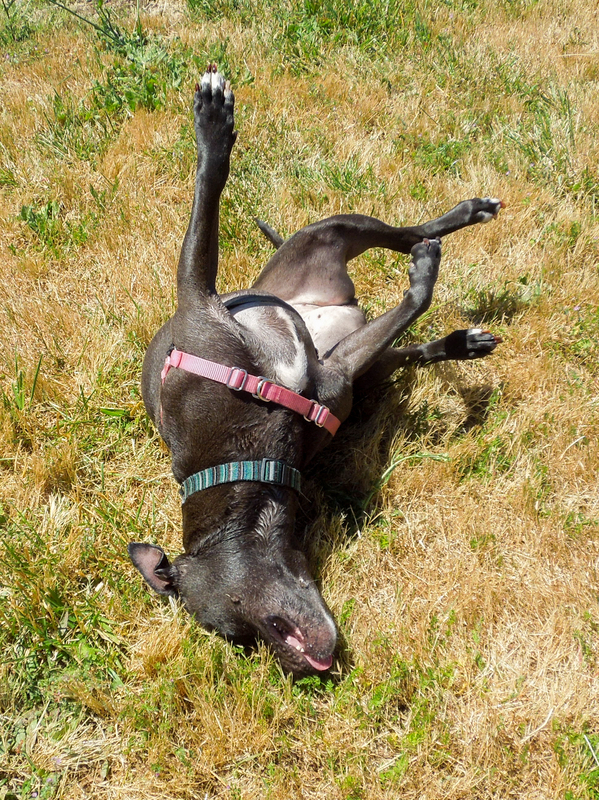 She does well with other dogs and older children, but cats are out, as she will chase anything that runs. 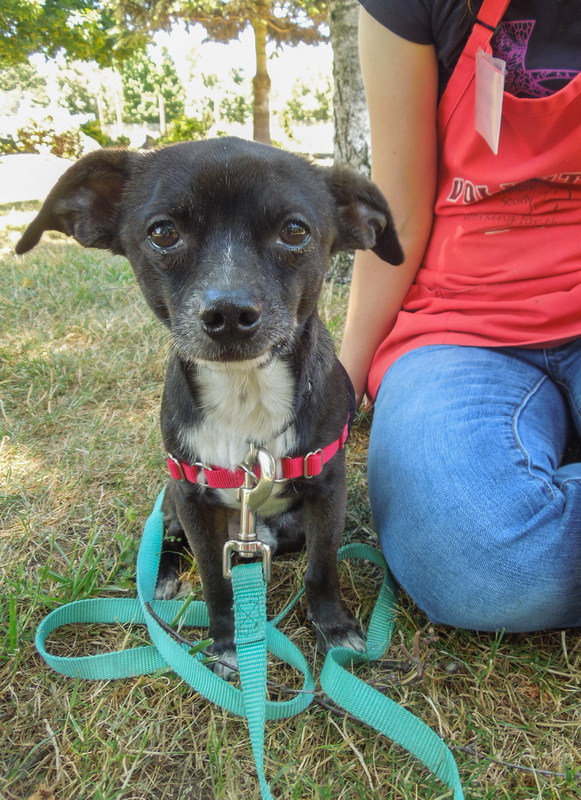 Elsa will need a lot of exercise, would probably be a whiz at agility, and at the end of the day, she’ll be a wonderful companion curled up next to you. Emelynn and I both fell for this sweetheart today. Looking for a new pal? Well you’ve found me! Now adopt me! 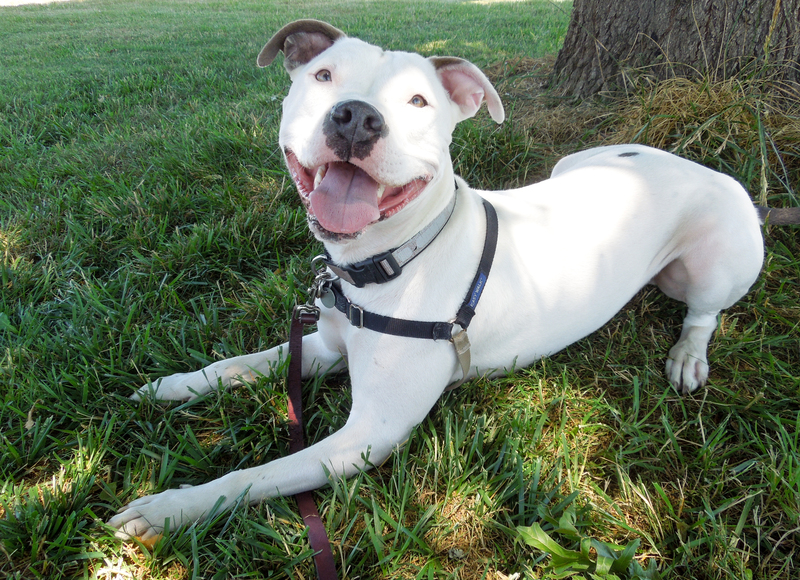 One of Marianne’s current favorite shelter dogs is Pal, a two-year-old Pit Bull Terrier mix. 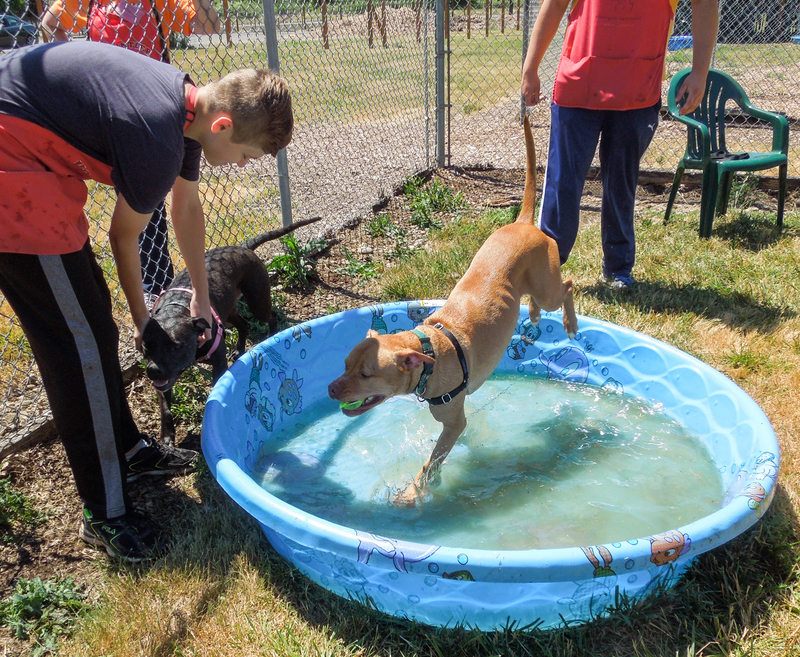 Pal has quite a large fan base, as volunteers have enjoyed working with this eager and energetic boy. Even when Pal was getting over a cold in the ISO kennels, he was still smiling. Pal is not a “needy” dog who will always be under foot. He is quite independent and while he enjoys being with his peeps, he is emotionally secure to be on his own. He is very treat-motivated and so is easy to train. 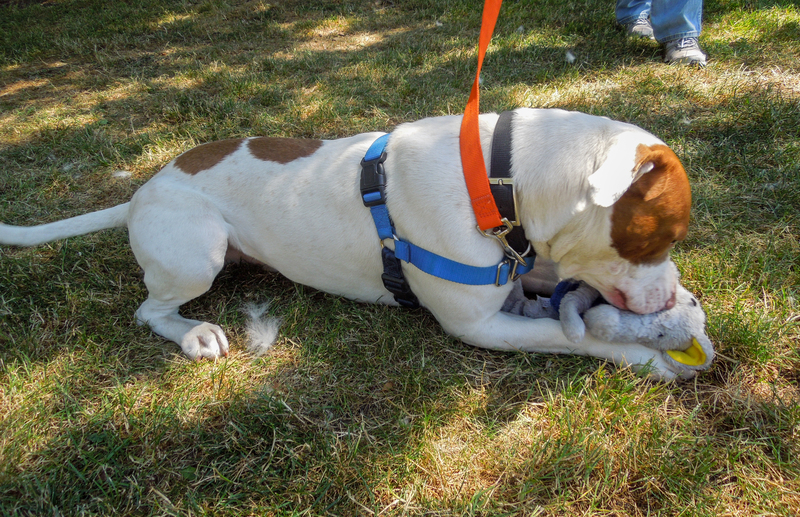 And he LOVES stuffed toys…to the point of needing very sturdy ones, if you get my point! Emelynn was quite torn today whether to choose Elsa or Pepper for her pick. In the end, she decided on Pepper because he is so shy. Pepper is a four-year-old Chihuahua mix. 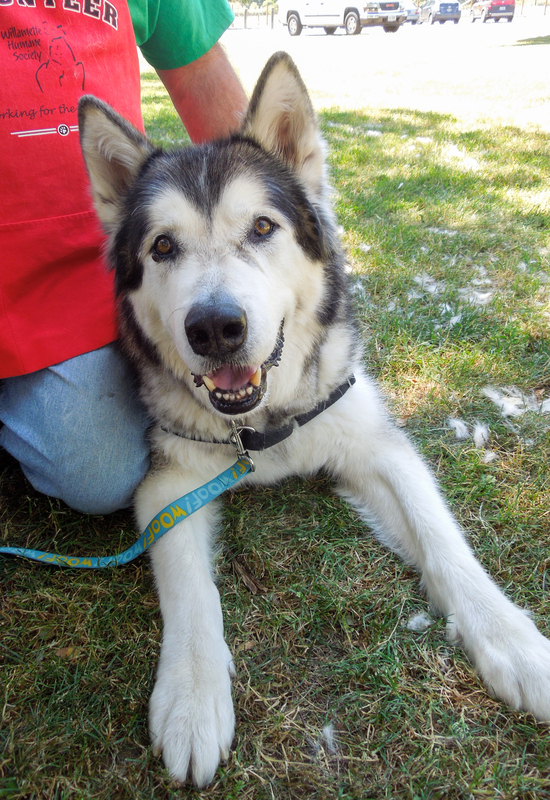 He is house-trained and would rather be in your lap or carried in your arms than anywhere else at the moment. He will need a patient person to show him that the world does not have to be a scary place and to build his confidence. 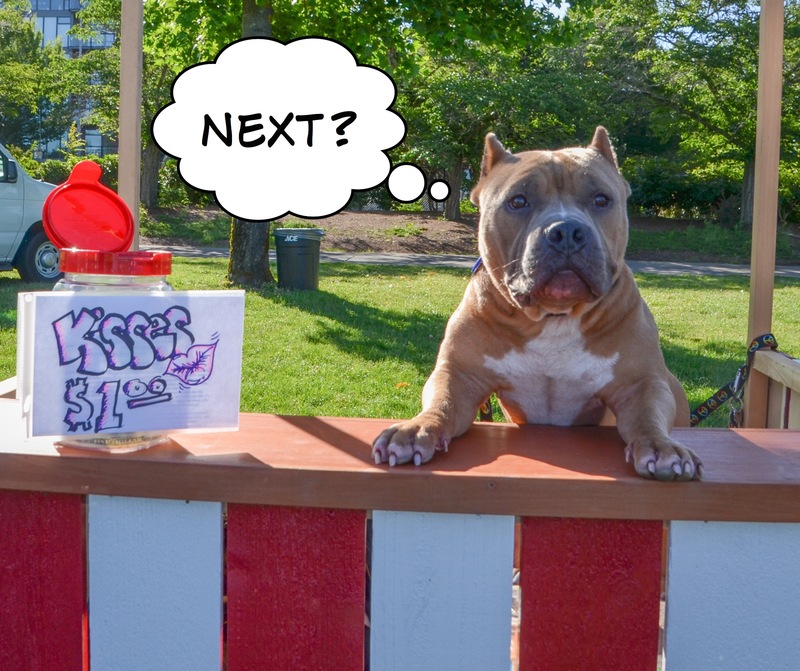 He did take my hot dog bits, but was hesitant, and I couldn’t get a smile out of him. Loud noises and quick movements frighten him. Pepper does like other polite dogs as long as they don’t overwhelm him. 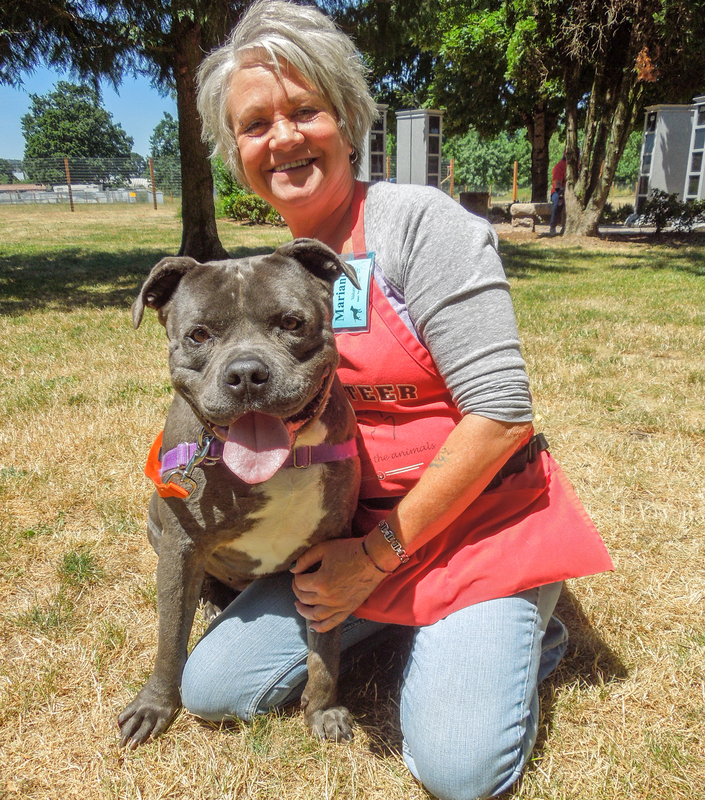 Pepper probably will never be an adventurous dog, but for someone looking for a quiet, loving best friend, Pepper is a perfect fit. Emelynn and I hope he won’t have to wait long for his understanding forever family. I’m new here. Yes, I have a big head. I think I’m quite handsome! 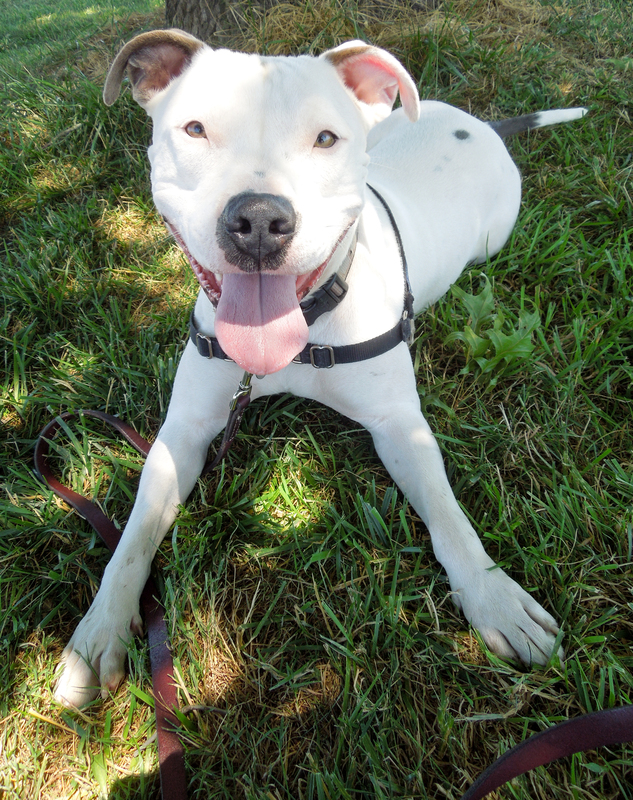 Meet Ludo, a one-year-old, seventy-eight pound American Bulldog mix. I met this big goofball for the first time this afternoon and had to agree with Marianne that he’s a wonderful boy. He came from California through our S.T.A.R.T. partnership, so we don’t know his history. 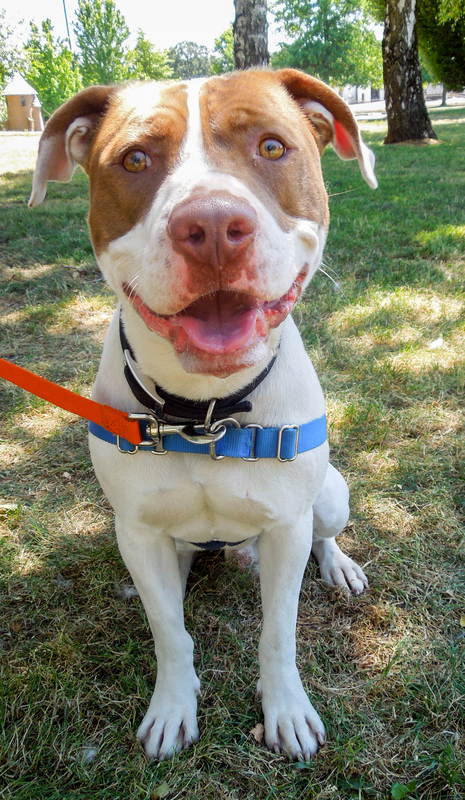 He smiles constantly, walks well on leash, took my treats politely, and loved the attention we gave him. He really is a gentle soul in a big body. He needs to lose a few pounds, but running around playing with his family and toys (which he loves) in a fenced back yard would do the trick. He would need to meet any dogs he would live with. As you can see, Ludo has become another Marianne favorite! I love the pictures of Mya and Jade i really love these two girls !!! Ludo is Wonderful We had alot of fun playing in the yard this morning..
Another wonderful post. I just love all the pictures and all of the dogs and the peoples smiles. It’s rather infectious. Great update Martha Could you add SWEET PEA in next weeks one if she hasn’t been adopted by then? Thank you for doing these. Always makes me smile. Another wonderful newsletter! The WillaMutt Strut looks like it was a success! I love the kissing booth!